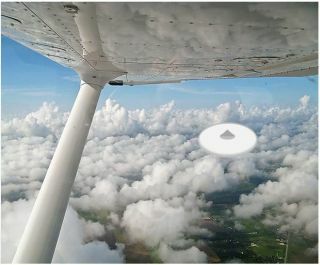 An artist's rendering of an object reportedly seen by a Cessna pilot traveling north toward Picayune, Mississippi, in April 2013. The pilot claimed to have seen a small metallic object about 3 feet (1 meter) in size just off his right wing. "To do real science, one would need a way to collect and store observations and measurements taken from a given field of study" — in this case, UFOs — and also to retrieve and correlate this data in the form of analysis and possible experiments, Harzan said. Back in 2006, MUFON instituted a database system, inputting nearly 70,000 alleged UFO cases that had been submitted by the public and investigated by certified MUFON field investigators. "Each month, MUFON receives between 500 and 1,000 UFO reports from all over the globe," Harzan said. "These reports come from many credible sources, including airline pilots, military personnel, former intelligence officers, doctors, lawyers, as well as the general public," with many detailed observations also involving photographs and video. This information is then stored in the MUFON database and made available to the public and used for scientific analysis, Harzan said. "Meanwhile, with the explosion of cellphones, video cameras, and print and online media reports, both past and present — as well as tens of thousands of paper UFO files collected by MUFON prior to 2006 — the need to be able to have all this data in one place and easily correlated is all the more important," Harzan told Space.com. That's why there's a need for a "new" global UFO database — "one that is easy to access, easy to use and easy to search, so that information can be correlated based on all sorts of parameters," Harzan added. The Mutual UFO Network (MUFON) is creating a new global UFO database. The goal is to catalog details like size, shape, color, flight characteristics, date and location from a wide variety of UFO reports, including newspaper and magazine article accounts, photographs and video. Then, researchers can combine all of these characteristics to draw deeper correlations and understandings, which have the potential to lead to breakthroughs. Larry Lemke, a retired aerospace engineer and a member of the executive advisory committee of the National Aviation Reporting Center on Anomalous Phenomena, is calling for the thoughtful scientific study of the UFO phenomenon. His comments represent only his own opinions, not those of any organization with which he may be affiliated. "I think UFO reports represent a substantive puzzle that warrants serious scientific attention, without advocating any particular position on what the answer to that puzzle is … whether it is purely psychological, purely physical or some combination of the two," he told Space.com. "Those of us who are old enough to remember the first half of the 'UFO era' have the definite perception that the public discussion of the topic has devolved," Lemke said. "As a society, we are collectively stupider on this subject than we were a generation ago." There are many reasons for this "dumbing down," Lemke said, but one of them is the leveling effect of the Internet. For quite some time now, he said, it has become trivially easy for an individual to misidentify a rocket launch or a spacecraft re-entry, or to gin up a Photoshop hoax and blast it around the world as a "UFO sighting." "Then, everyone 'researches,' analyzes and comments on it with all the depth of thought that can fit in a 140-character tweet," Lemke said. Lemke thinks the main challenge of "UFOlogy" has always been to "decipher a small signal amid a large amount of noise." "What we need to do is, elevate the conversation to the professional research scientist/engineer level," Lemke said. "At the moment, the action on this front appears to be with private groups in France and Chile who have agreed to cooperate in the open investigation of UFOs. I wish them well in the coming years," he said. This graphic shows that UFOs take on all sizes and shapes. Well-known UFO debunker James Oberg said he thinks the mass media's UFO coverage is sinking to "even lower lows of silliness and superficiality," such as the steady stream of "UFOs buzz the International Space Station" fairy tales. "It gets harder and harder to filter out the truly interesting reports that are lost in the noise and garble," Oberg said, and he has found some such reports. "They don't have to be alien visitors, and I have seen no convincing evidence for even a single event of this nature," Oberg said. "But they often can be secret military aerospace activity, particularly in Russia and China," and that fully explains U.S. military intelligence agency interest in foreign "UFO reports," he said. "Any number of human agencies can — and probably has — found it useful to be mistaken by the public for flying-saucer visits, but that usually seems opportunistic rather than deliberate," Oberg added. "These can be governments, corporations, even criminal enterprises. Once in a while, a hoaxer or spoofing club adds more mud to the water." "So, diligent records-keeping, report writing, witness interviews, as conducted by generations of seriously interested private part-time investigators, can provide information which only years or decades later makes sense. It may not be the explanations most of them were hoping for, but it makes their work honorable and constructive all the same," Oberg said. "Kudos to them — may their tribe increase!" Taking a long look, Oberg said that there is no denying the prospect that humanity may someday encounter evidence for the activity of genuine extraterrestrial intelligence, somewhere. "It may be shockingly overt or gently subtle," he said. "The current cultural garble factor of 'UFO reports' probably is a serious hindrance to recognizing the latter kind of detection." Writer and UFO skeptic Robert Sheaffer said that part of the problem with so-called UFOlogy lies in separating science fiction from real science. "The major fault line in UFOlogy today is the division between what can be called 'new-age' UFOlogy and what its proponents call 'scientific' UFOlogy … but is, in reality, science fiction," Sheaffer said. Both are junk science, he said, and consistently ignore Occam's razor — that is, all other things being equal, the simplest solution is the best. "Proponents fail to reconcile whatever hypotheses they invent with the rest of the body of established scientific fact," Sheaffer told Space.com. "While the dividing line between the two groups is not hard and fast — and some UFO claims will contain elements of both — most major UFOlogists and UFO groups will fit clearly into one group or the other." Sheaffer said that MUFON is not the first attempt to build a major UFO database, but merely the latest. Some have even sought to augment data collection with a "rapid response team" to go out and do real-time, on-site investigations, he said. "None of these attempts have ever been successful," Sheaffer said. A central investigative group delving into the UFO phenomenon is the Mutual UFO Network (MUFON), based in Newport Beach, California. The current trend in UFOlogy seems to be toward "tabloid trash," especially as seen in television shows like "Ancient Aliens," Sheaffer said. "'Hangar 1'is supposed to be the place MUFON's supposedly vast collection of UFO data, or UFO stories, is kept," Sheaffer said. "And what, exactly, does MUFON serve up from its precious archives? Some of the most preposterous, unsubstantiated stories in the UFO literature, and some outright fabrications." In that recently debuted cable TV series, "the scientific method is nowhere to be seen," Sheaffer said. Doubters aside, MUFON's Harzan is resolute in his view that unraveling the UFO saga can have several clear benefits for humanity. For one, deciphering the technology these craft display, he said, would mean far faster terrestrial transportation, not to mention trips off-planet. "A second major benefit would be breakthroughs in the energy these craft use to power themselves," Harzan said. "From the thousands of observations we have, they are not using propellers, jet engines or rocket motors to propel themselves, nor do they require large fuel tanks." But Harzan said that the greatest benefit of understanding UFOs — if they are, in fact, advanced otherworldly craft with intelligent beings onboard — "would be the way that we look at ourselves as a human race, and where our place in God's great creation is amongst all the other sentient life he has created in the universe." Harzan's personal view is that once humanity grasps that we are all part of the same human race, perhaps the need for wars due to our differences will end. "Now that would be a true benefit to everyone on this planet," he concluded. Leonard David has been reporting on the space industry for more than five decades. He is former director of research for the National Commission on Space and is co-author of Buzz Aldrin's 2013 book "Mission to Mars – My Vision for Space Exploration," published by National Geographic with a new updated paperback version to be released this May. Follow us @Spacedotcom, Facebook and Google+. Original article on Space.com.